O Deep beyond the deeps, Thou art still! We feel not thy flaming breath of Will. In secret dwells in our nature’s dusk. O Queen of zenith unseen! The Play of Death within Thee ends. Upon the world’s nakedness descends. The first is the aspect of immensity, vastness and profundity, called Maheshwari. “Maha” means great and “Ishwari” means goddess. So, Maheshwari is the great Goddess, the great Mother. Maheshwari has another name which is very familiar to us: Durga. 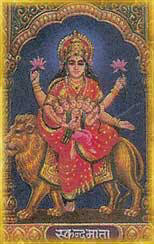 Most of India worships this aspect of the Divine Mother. Day in and day out Durga fights to establish the Divine Truth here on earth. When Sri Ramachandra was engaged in a terrible fight against the demon Ravana, he prayed to this particular goddess. Durga showered her utmost blessings upon the devoted head and heart of Sri Ramachandra and he won the battle.